Born in Millville, New Jersey, Waldman was raised on MacDougal Street in New York City's Greenwich Village, and received her B.A. from Bennington College in 1966. During the 1960s, Waldman became part of the East Coast poetry scene, in part through her engagement with the poets and artists loosely termed the Second Generation of the New York School. During this time, Waldman also made many connections with earlier generations of poets, including figures such as Allen Ginsberg, who once called Waldman his "spiritual wife." From 1966-1968, she served as Assistant Director of the Poetry Project at St. Mark's; and, from 1968–1978, she served as the Project's Director. In 1974, with Trungpa, Ginsberg, and others, Waldman founded the Jack Kerouac School of Disembodied Poetics at the Naropa Institute in Boulder, Colorado (now Naropa University), where she remains a Distinguished Professor of Poetics and the Director of Naropa's celebrated Summer Writing Program. Waldman has been a fervent activist for social change. In the 1970s, she was involved with the Rocky Flats Truth Force, an organization opposed to the Rocky Flats nuclear weapons facility ten miles to the south of Boulder, Colorado. With Daniel Ellsberg and Allen Ginsberg, she was arrested for protesting outside of the site. She has been a vocal proponent for feminist, environmental, and human rights causes; an active participant in Poets Against the War; and she has helped organize protests in New York and Washington, D.C. Waldman says that her life's work is to "keep the world safe for poetry." Waldman has published more than forty books of poetry. Her work has been widely anthologized, featuring work in Breaking the Cool (University of Mississippi Press, 2004), All Poets Welcome (University of California Press, Berkeley, CA, 2003), Women of the Beat Generation (Conari Press, Berkeley, CA, 1996), Postmodern American Poetry (W.W. Norton, New York, 1994) and Up Late (Four Walls Eight Windows, New York, 1988) among others. Her poems have been translated into French, Italian, German, Turkish, Spanish, and Chinese. Waldman is also the editor of several volumes relating to modern, postmodern, and contemporary poetry. Over the course of her career, Waldman has also been a tireless collaborator, producing works with artists Elizabeth Murray, Richard Tuttle, Meredith Monk, George Schneeman, Donna Dennis, Pat Steir; musicians Don Cherry, Laurie Anderson, and Steve Lacy; dancer Douglas Dunn; filmmaker and husband Ed Bowes; and her son, musician/composer Ambrose Bye. Waldman has been a Fellow at the Emily Harvey Foundation (Winter 2008) and the Bellagio Center in Italy (Spring 2006). She has also held residencies at the Christian Woman’s University of Tokyo (Fall 2004); the Schule für Dichtung in Vienna (where she has also served as Curriculum Director in 1989); the Institute of American Indian Arts in Santa Fe, New Mexico; and the Stevens Institute of Technology in Hoboken, New Jersey (1984). She has served as an advisor to the Prazska Skola Projekt in Prague, the Study Abroad on the Bowery (since 2004), and has been a faculty member in the New England College Low Residency MFA Program (since 2003). She is the recipient of grants from the National Endowment for the Arts (NEA) and the Contemporary Artists Foundation, and the Poetry Foundation. With writer and scholar Ammiel Alcalay, she founded the Poetry Is News Coalition in 2002. Waldman also won the International Poetry Championship Bout in Taos, New Mexico twice. In 2011, Waldman was elected a Chancellor of the Academy of American Poets. First Baby Poems, Rocky Ledge, 1982, augmented edition, Hyacinth Girls, 1983, republished, BlazeVOX Books, 2008. Empty Set: a Universe of Discourse, (with Alexis Myre), Overpass Books, 2016. Fukushima Mon Amour, (with Daniel de Roulet, Sylvia Federici, George Caffentzis, & Sabu Kohso), Autonomedia, 2011. Harry's House, Volume 3 (compilation), Fast Speaking Music, 2015. Ghost Dance, (Anne Waldman, Thurston Moore, Ambrose Bye - Patti Smith cover), Fast Speaking Music, 2014. Harry's House Archive (compilation), Fast Speaking Music, 2014. Harry's House, Volume 2 (compilation), Fast Speaking Music, 2014. Jaguar Harmonics, (music by Devin Brahja Waldman, Ha-Yang Kim, Daniel Carter), Fast Speaking Music, 2014. Harry's House, Volume 1 (compilation), Fast Speaking Music, 2011. Matching Half (music by Ambrose Bye) with Akilah Oliver, 2007. Talking Poetics: Annals of the Jack Kerouac School of Disembodied Poetics (with Marilyn Salzman Webb), Shambhala, vols. 1 and 2, 1978. Waldman's poem, "The Lie" shows her Buddhist beliefs. It's based on the Buddhist belief that everything is an illusion. The refrain in the poem, "Art begins with a lie," connects back to the belief that everything is an illusion. When one looks at a lightbulb, but then closes his eye, he can still see the lightbulb, even though his eyes are closed. This relates to the idea that every perspective of the world is a misconception and that there is no real truth. American Book Award, Lifetime Achievement Award, 2015. Guggenheim Fellowship Award in Poetry, 2013. PEN Center Literary Award in Poetry, 2012. ^ "Anne Waldman:". www.poetspath.com. Retrieved March 21, 2018. ^ "Anne Waldman". www.poetspath.com. Retrieved March 21, 2018. ^ "Anne Waldman Autobiography:". www.poetspath.com. Retrieved March 21, 2018. ^ "Anne Waidman". www.poetspath.com. Retrieved March 21, 2018. ^ Waldman, Anne (March 6, 2001). "Anne Waldman". Anne Waldman. Retrieved March 21, 2018. ^ Healer, Chris. "Anne Waldman: Make Up on Empty Space". www.poetspath.com. Retrieved March 21, 2018. ^ "The New Weathers: Anne Waldman on Poetry and Protest". The Wire. Retrieved March 2, 2019. ^ "Various - The Nova Convention". Discogs. Retrieved March 2, 2019. ^ "Various - Big Ego". Discogs. Retrieved March 2, 2019. ^ "Various - Disconnected (The Dial-A-Poem Poets)". Discogs. Retrieved March 2, 2019. ^ "Various - The Dial-A-Poem Poets". Discogs. Retrieved March 2, 2019. 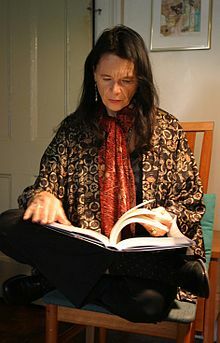 Wikimedia Commons has media related to Anne Waldman. This page was last edited on 2 March 2019, at 19:32 (UTC).